My birthplace, Allahabad was on the site of ancient Prayag, a holy city at the confluence of the Ganges and Jumuna rivers. It is said to be as old as Benaras, and owns King Ashoka's stone-carved edicts on pillars inside Allahabad's old fort. India's reverence for rivers led to the celebration of the kumbha mela held every twelve years on the banks of the Ganges. When I learnt of this history in school I was thrilled that as children we used to take walks our parents at those sacred ghats. My liking for history occurred more out of a choice of available school subjects than a passion to learn about the past. 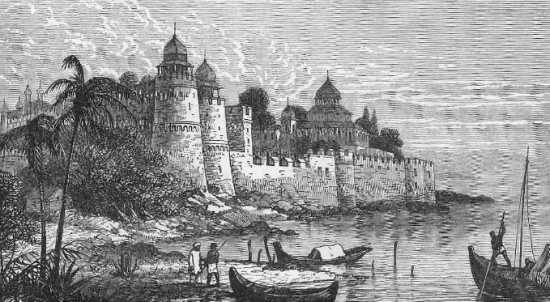 However the discovery that Allahabad was named by Emperor Akbar in 1583, who called it "Al-Allahabad" or city of God and made it the provincial capital from 1599 to 1604, gave me a perspective of the city and importance. As was wont to happen, the British were ceded the city in 1801 and it was witness to a terrible massacre of Indians during the 1857 Mutiny. Only after the Partition did history books rewrite the sacrifices of our freedom fighters in those early episodes that led to India's freedom, ninety years after the uprising. Allahabad was Uttar Pradash's capital from 1904 to 1949, and also the birthplace of the famous Pandit Nehru family. So here I was on real historic ground. My memories of Allahabad are hazy in the dust storms and loo winds that are a typical feature of the north Indian landscape. I was a toddler in Baby class at St Mary's Convent managed by German nuns who spoke English in a heavy European accent. I recall that during tiffin break we would stream out of class to play under the scattered shade of neem and mango tree. The soft powdery dust under the neem tree, sprinkled with tiny neem flowers housed some funny little insects. Someone showed us that if we prodded the mud with the fallen neem sticks and recited a line "gugu, gugu come to me and I will teach you abc," lo and behold, insects would scuttle out, making us giggle with joy. What innocence in play! The principal of St Mary's school was Mother Nicodemous who flashed a gold tooth when she smilled. We used to be somewhat scared of her, but she took care to stop by and say "Good morning". The Mother and Sisters who took our classes would spend a little bit of every class period to instill qualities of kindness and sharing with our classmates. It was their commitment to build our characters, not just to school us in books. Allahabad as the provincial capital of the United Provinces, one of Indian's largest provinces had a sizeable Muslim population. The influence of Aligarh's ground breaking revolution of the 19th century awakening the Muslim population had reverberated throughout the land. By the 1930s girls education had started receiving the support of Muslim families and the names of Syed Ahmad Khan, Maulana Shibli, Mohammad Ali, Shawkat Ali, Zafar Ali Khan and Maulana Hasrat Mohani had become an inspiration. The renaissance of Muslim identity and the need for adapting the coloniser's educational tools to achieve success, along with the academic excellance emanating out of the MAO College (Muslim Anglo Oriental) and the Aligarh Muslim University established in 1920, set the backdrop for the next generation. Right to their identity and to convince Muslims of their need to awaken and participate in national development activities cannot be minimised. We may recall that it was in 1881, during Lord Ripon's Vicroyship that the Education Commission allowed vernacular schools to be released from European hands and be managed by Indians. Shortly after in 1886 the Public Service Commission however established a distinction in the grades of Europeans and Indians in the Department of Education. The superior cadre was given to Europeans while Provincial Educational Services, were to remain with Indians. This inequity had its negative effects. Over decades the medium of instruction became a provincial matter and in the English system schools, students received education with the object of preparing for higher studies and gained a kind of upper hand. All branches of science were to be taught in English, thus marginalising large sections of the populace. The developments were no doubt dependent on the prevailing conditions at that time. St Mary's was an imposing red brick building with long arched verandahs and airy classrooms. The playgrounds were large spaces with courts for badminton and basket ball, and area for physical exercise called PT and other athletic games. The morning assembly commenced with the British anthem God save the King, and prayers for the prosperity of all. Our teachers were British or Anglo Indians and imparted courteous mannerisms policy speech and principles of truth and honesty in our daily routine. During the scorching heat of summer when temperatures soared to 115°F indoor recreation was provided. Verandah cane chiks with cotton lining were lowered to keep the blazing sunlight out, and we were given Hand Work classes. These practicals were extremely useful in increasing our skills in paper cutting crafts, basket and flowed making plastercine modeling and map drawing, which came in handy later in life. On one side of the classroom there was a large sand tray in which cardboard cutouts or models were placed to depict a scene like the 'Farmer at work', 'Fisherman on the River', or 'Mountain Woodcutter' and 'Jungle Scene'. We learnt a lot of our geography by making these practical models and had fun too. The school bell would ring at the end of every class period and the girls would come out in groups chatting cherrily, but jostling and screaming was not allowed. When we would return home at 4 o'clock the servant under my mother's supervision had already laid out the table for afternoon tea, a very British concept. As we were hungry by this time we enjoyed the tea-cakes, sandwiches and sherbat of falsa fruit, jamun, water melon and above all the famous limbu-pani or lime juice which was a fantastic panacea to beat the heat. Milk was a bed time beverage. In winter our evening tea time was with a cup of hot milk with Ovaltine or cocoa and a variety of home made savories like Pakaras, samosas, fruit chaat, shami kababas etc. One of the important events in the school calendar was Prize Giving Day. In those days the VIP who handed the prizes was an esteemed personality of society. There was no question of politicians being invited. The person was one who inspired the students, and was a role model to the young. Many students were inspired as to emulate those persons in later life. Prizes went to the best student in every class, an all-rounder good in the academic field as well as in character and social performance. The school used to commemorate Remembrance Day of the 1st and 2nd World Wars. It was called Poppy Day to remember the soldiers who died in the poppy fields of Holland, France, and Belgium. Children used to make paper poppies out of red crepe paper and pin then on their navy blue tunics. There were special parades and band playing. The legacy of the Colony for better or worse, was perpetuated. My pragmatist father and the fact that my mother had been schooled in a missionary Christian institution, the Isabella Thoburn College of Lucknow, made it normal that we three children enter convent schooling. Many Muslim families sent their girls to Muslim vernacular schools, where the dress code was Muslim, and the school bullock drawn carriage was draped with white sheet curtains ensure the passengers were not visible. As students of St Mary's School we reached school by bus and wore pleated tunic and blouse uniforms with ties. We were indirectly the beneficiaries of Sir Syed Ahmed's education reforms. the bridges he built through his writings and campaigns to convince the British regarding the recognition of Muslim people's.